WWI 183rd Aero Squadron Enlisted Patch. White hand embroidered details on a dark wool background. Unused. WWI 193rd Aero Squadron Enlisted Patch. White hand embroidered details on a dark wool background. Unused. WWI 206th Aero Squadron Enlisted Patch. White hand embroidered details on a dark wool background. Unused. WWI 221st Aero Squadron Enlisted Patch. White hand embroidered details on a dark wool background. Unused. WWI 247th Aero Squadron Enlisted Patch. White hand embroidered details on a dark wool background. Unused. WWI 291st Aero Squadron Enlisted Patch. White hand embroidered details on a dark wool background. Unused. WWI 293rd Aero Squadron Enlisted Patch. White hand embroidered details on a dark wool background. Unused. WWI 303rd Aero Squadron Enlisted Patch. White hand embroidered details on a dark wool background. Unused. WWI 306th Aero Squadron Enlisted Patch. White hand embroidered details on a dark wool background. Unused. 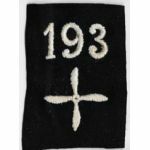 WWI 313th Aero Squadron Enlisted Patch. White hand embroidered details on a dark wool background. Unused. WWI 340th Aero Squadron Enlisted Patch. White hand embroidered details on a dark wool background. Unused. WWI 346th Aero Squadron Enlisted Patch. White hand embroidered details on a dark wool background. Unused. WWI 357th Aero Squadron Enlisted Patch. White hand embroidered details on a dark wool background. Unused. WWI 366th Aero Squadron Enlisted Patch. White hand embroidered details on a dark wool background. Unused. WWI 367th Aero Squadron Enlisted Patch. White hand embroidered details on a dark wool background. Unused. WWI 371st Aero Squadron Enlisted Patch. White hand embroidered details on a dark wool background. Unused. WWI 392nd Aero Squadron Enlisted Patch. White hand embroidered details on a dark wool background. Unused. WWI 406th Aero Squadron Enlisted Patch. White hand embroidered details on a dark wool background. Unused. WWI 418th Aero Squadron Enlisted Patch. White hand embroidered details on a dark wool background. Unused. WWI 423rd Aero Squadron Enlisted Patch. White hand embroidered details on a dark wool background. Unused.